← How did Shakespeare sound? What part of Chapter Four can you extend to one of our projects? 8 Responses to What part of Chapter Four can you extend to one of our projects? New slave markets, named after prominent city slave traders, sprang up on Wall Street near the East River. New York was building a contract with slavery. By 1741, one-fifth of the city’s population consisted of black slaves—nearly 1,800 amid a total population of about 10,000. Blacks were one-third of the city’s workforce; they were rapidly replacing its white indentured servants. Slaves fueled New York’s industry, as they made up 18% its population. Eventually, African-Americans became 33% of the workforce of the city. The presence of slaves in New York is somewhat similar to that of Connecticut. Slaves helped cultivate and harvest crops, including food, along with participation with regular, household chores. Our Slave, Old Ti, played a much more prominent role in Suffield, as he was the town sexton and a library assistant to this master. Slaves in Connecticut also helped drive the tobacco industry, which is still dominant throughout the state today. Many think of African slaves as unintelligent and passive people, however, this was not the case. Instead, they always tried to revolt against their captors on the ships that carried them to the New World. Some slaves even starved themselves to death so that their slave masters would not make a profit. One example of slaves rebelling against their masters was an event that occurred in New York City on April 6, 1712. Twenty-four enslaved men gathered and set fire to an outhouse. As the white men came out to tend to the fire, the slaves attacked them. Eventually, the slaves were outnumbered and driven into the forest. The slaves thought that the dust that a witchdoctor gave them would make them invisible. The witchdoctor turned out to be a fake and most of them were captured. In Pennsylvania an African was arrested for arson and the judge called for stronger laws because of what he/she considered hostile behavior.In London slaves faced extreme punishment after murdering Adrian Hoghlandt three slaves were totured. One was tied to a wheel until his bones were smashed with a crowbar until he died. Another was chaing then strung up and kept hanging without food or water until he died. Then they burned the third slave with a slow fire until he to died. The more and harder the African slaves fought back the more severe the punishments became. Slaves were not just killiing their masters they were killing themselves. Everyone was in panic not knowning what was going to happen next. The New Yorkers just responded back to the rebellion in 1712 and then more rules were made to control the slaves. 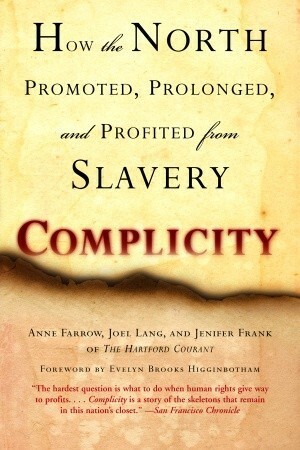 Complicities fourth chapter expands on the whites fear of slave’s notion. Fear of Slave rebellion originated in the Caribbean where in most instances slaves burned the plantations they were working on in order to win their freedom. Arson, poisoning, and brute force were all tactics used by slaves in their fight for freedom. New York held many slaves, almost 600 documented slaves during the 1700’s. The City’s judicial records record the names and crimes of many rebel slaves. For instance the burning of Fort George after the notorious “great snow” in 1741 was a successful attack planed out by slaves from within the city. This attack was later linked to a plot (never executed) which involved the massacre of white men in the colony and the capture of their wife’s. These instances diminish the notion that slaves where just compliant happy helpers. Before reading this last chapter i had no idea that slaves went to the extremes they did to escape slavery. the book gives examples of slave riots and slaves even killing themselves so their owners would lose money. this is contrary to the view many people have to slaves. People usually think of them as relatively passive hard workers who didn’t know anything but this book really speaks wonders to the fact that slaves were in fact very intelligent people, and deserve more credit than they get. Chapter four of Complicity is a very important one. It is important that whenever we give a presentation or speak to people about Suffield’s history it is important that we instill the idea that the North benefitted from Slavery just as much as the South did. Some historians even support the statement that Connecticut was the Georgia of the north because of how many slaves were brought in. Especially in our case, where we are trying to learn the facts of slavery in Suffield and the personal side’s of the story, we must also acknowledge and investigate the cases of escaped slaves. Just as the slaves revolted in New York, slaves in Suffield must have tried to escape or hurt their owners at some point, even though it would be on a much smaller scale. This is also interesting for me as I live near a possible village in which escaped slaves as well as other outcast’s lived and hid. Reading chapter four also comes at a great time, just as we learned that Old Ti’s father was once arrested for “breaking and entering”. The best part of this class is that we also try to look through the slaves eyes. Chapter four also made it clear that slaves are generally looked at as un-intelligent hard workers. I believe that this is far from the truth. Although uneducated in the New England style of education, slaves such a Old Ti we very intelligent. Old Ti played such a huge role in Suffield’s history and worked so many jobs, that it reflects on his ability to adapt, learn, and ultimately win his freedom. Chapter 4 truly presents the “other’ side that unlike the North the slaves may not have been complicit with slavery. Accounts of attacks show a different story than those of attacks. Here the slave is risking there life by attacking their owner, probably step one before step two: escape. What is interesting to me is the that although Whites at the time viewed them as nothing more than an animal that can do labor much like a man, they were at the same time capable of much more. Looking back its easy to say thats obvious we are all human, but back then I’m not sure every one held the same view. It is very important to understand from Chapter 4 that many time Caribbean slaves would revolt from their masters. Sometimes these revolts were violent and resulted in the death of both slaves and masters and the destruction of property. If slaves in the Caribbean were to harbor such feelings of discontent to the point of violence it is safe to assume that similarly slaves in Connecticut harbored such feelings and would act out on those feelings. Being the “Georgia of the North”, Connecticut was to home to many slaves who, for the most part, instead of violently attacking their captors, they would escape to different havens across the North East.